The Hilux Single Cab, is the nation’s favourite workhorse and powerful all-rounder. It is modern, masculine and undeniably tough. The Hilux has been purposely designed to make loading and offloading easier and the sturdy load boxes will carry the toughest gear. Chunky front bumpers with a contrasting grille and muscular integrated wheel flares on a wider body take the Hilux to a new fresh dimension. Despite its tough, uncompromising exterior, the Hilux interior is well appointed and comfortable. The Hilux delivers superior ride quality and enhanced quietness for a more than welcoming experience. The Hilux Single Cab is the toughest, most cost effective bakkie on the market with reduced fuel consumption, increased towing capabilities and increased load space. It is widely respected for its dual capabilities as a tough workhorse and tow-vehicle. The Toyota Hilux has long been the known as a firm favourite in challenging environments. The Hilux certainly has presence. 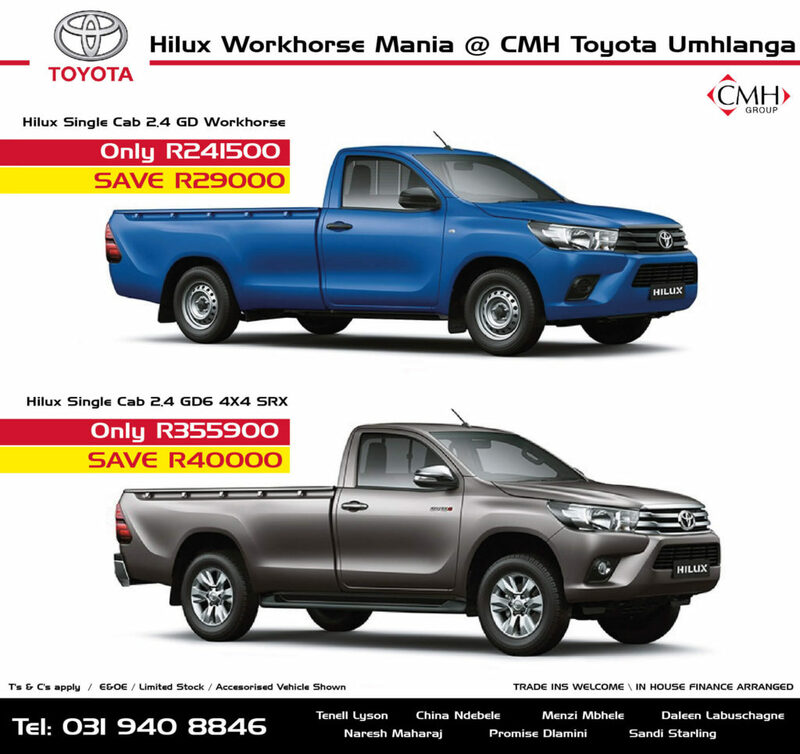 For huge saving, come on in to CMH Toyota Umhlanga and take advantage the special offers on the single cab range. For more details visit showroom or call 031 580 4000. Our sales team are waiting to assist you into your Hilux Single Cab.